Today’s metal service centers and similar facilities require more accurate load weight data for the products they ship and receive. They also want their coil handling equipment to move their products faster, less expensively and without damage. Bushman Equipment, Inc. combines the two processes, joining our rugged material handling equipment with the most advanced electronic load weighing equipment to give you fast, accurate and repeatable digital weight information. All Bushman Equipment, Inc. products conform to the latest revision of ASME Spec. B30.20 and BTH-1: Design of Below-the-Hook Lifting Devices. Four-inch digital scoreboard that is visible from over 100 feet. On-site calibration by Bushman Equipment, Inc. technicians. Remotely mounted scale unit and scoreboard. Bushman Equipment, Inc. hook blocks (or bottom blocks) have 360-degree, manual or powered rotating crane hooks that permit positioning of heavy or awkward loads in less accessible work areas. Does not increase the overall height of the bottom block, an important feature for buildings with low headroom. Eliminates the need to have multiple coil grabs equipped with load weighing electronics and reduces the amount of calibration work required. Reduces EMI/RFI (electromagnetic or radio frequency interference) because the load weighing equipment is mounted directly on the bottom block. 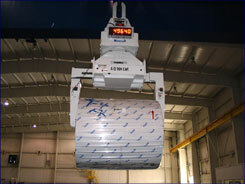 Bushman Equipment, Inc.’s motorized coil lifting equipment weighs coils while loading or unloading them from the truck. The load cell is incorporated into the bail assembly. 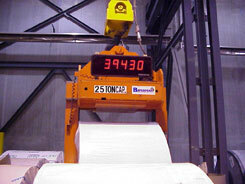 The weight can be sent via radio modem to remote scoreboards, shipping computers or printers, eliminating the need to run more network cabling throughout the warehouse. 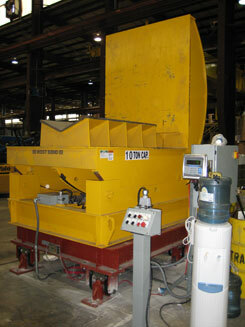 Low headroom coil grabs are also available with coil weighing capability. 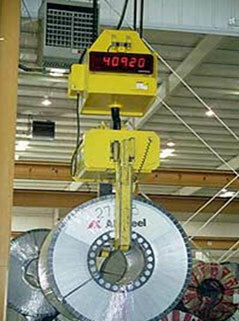 A major steel company is using two of these M5067 coil lifters with built-in weigh systems to reduce product handling. They found these lifts save time and reduce product damage compared to their old procedure that used a floor scale for weighing. 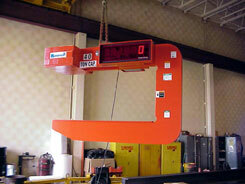 Bushman Equipment, Inc. C-hooks can also be equipped with integrated load weighing systems. The accuracy of the load cells is from plus or minus 0.2% to 0.5% of full load. All equipment is compatible with most current network and computer systems. The calibration settings are saved in memory even during loss of power. All Bushman Equipment, Inc. C-hooks are designed and manufactured in accordance with ASME Spec. B30.20 and BTH-1: Design of Below-the-Hook Lifting Devices. While moving through the process bay, coils are often placed on a floor scale and then on the upender. 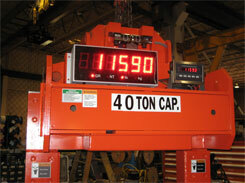 By including a load weighing system in your upender, you can upend and/or rotate coils and weigh them simultaneously. This reduces handling time and minimizes damage to the product. Using multiple load cells in the base of the upender, the signals are summed and a stabilized weight is displayed, unaffected by the motion of the upender.